The Broad Street Run was an experience I will likely never forget. Philadelphia’s annual 10 mile race brought 30,000 people this year, and it felt like there were 30,000 people there! The whole weekend started with nerves and stress over how to get to the start line. It wasn’t very clear how to get there, and I was not sure what to do! 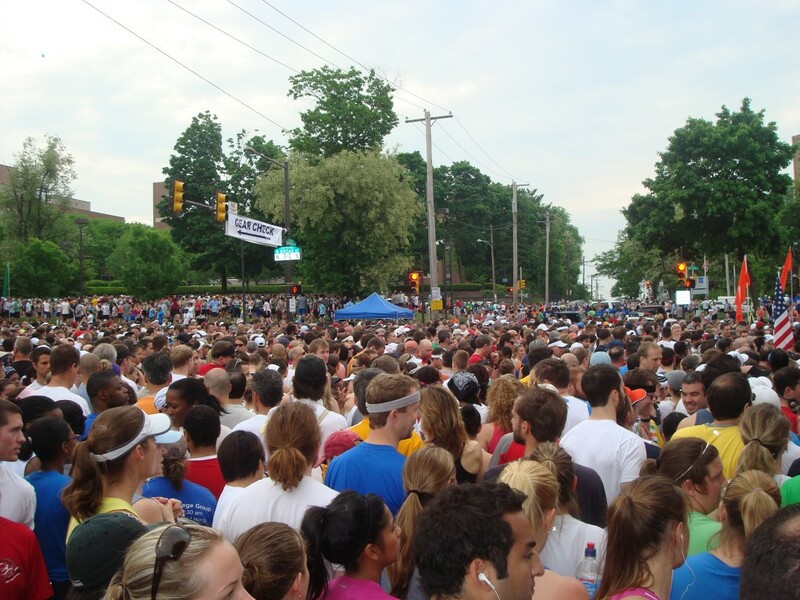 Fact #1: The Broad Street Run is 10 miles STRAIGHT down Broad Street! You finish in a different place than the start. This race was the first time I experienced that. PhillyBoy finally came home from his trip Saturday night and shared the plan. 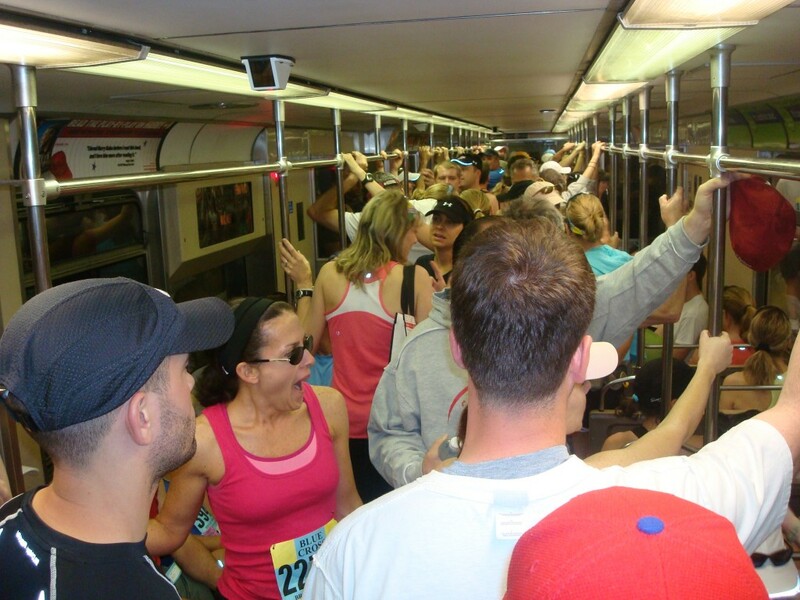 We would drive to the stadium, park our car, and take a free Septa subway ride to the start. Despite the thousands of people doing the same thing as us, this worked perfectly and we got to the start by 7:10 AM (actual start time was 8:30 AM). We made plans to meet all of our friends at the high school track near the start, and somehow, miraculously, we all found one another! Fact #2: Picking a meeting place and a time to meet up with a group works… even without cell phones! I almost forgot what that was like. After a trip to the sea of port-a-potties we all made our way to the start, and most of us started together in the orange corral. One friend mistakenly put his finish time at 60 minutes and ended up with a bib number of 709. Rock on! The race began and the energy was addictive. The sea of thousands of new and experienced runners was energetic and exciting, and I couldn’t wait to cross the start line. The race opened up fairly quickly. I really appreciated the lack of bottlenecking in this race. Broad Street is quite wide and there weren’t too many spots of congestion. Due to the anticipated hot weather they opened many fire hydrants to use as sprinklers to cool us down, and it was greatly appreciated. Fact #3: Races that start at 8:30 AM should not be taken seriously. By the 3rd mile it was H O T out there and people were dropping left and right due to dehydration. It was really sad and scary to see all of these fit people sitting on the side trying to hydrate themselves. Why doesn’t the race start earlier? The first 3 miles were so fun for me. My friend Erika shot up ahead of me but I kept her in my line of sight and planned on catching up to her around mile 5. I lost sight of her around mile 5, and by then first time racers Jake & Gina caught up with me! I was so excited when I heard Gina yell “RhodeyGirl Tests” and I ran a bit with them. It was so fun to run together. By this point- mile 5- I was in incredible pain. 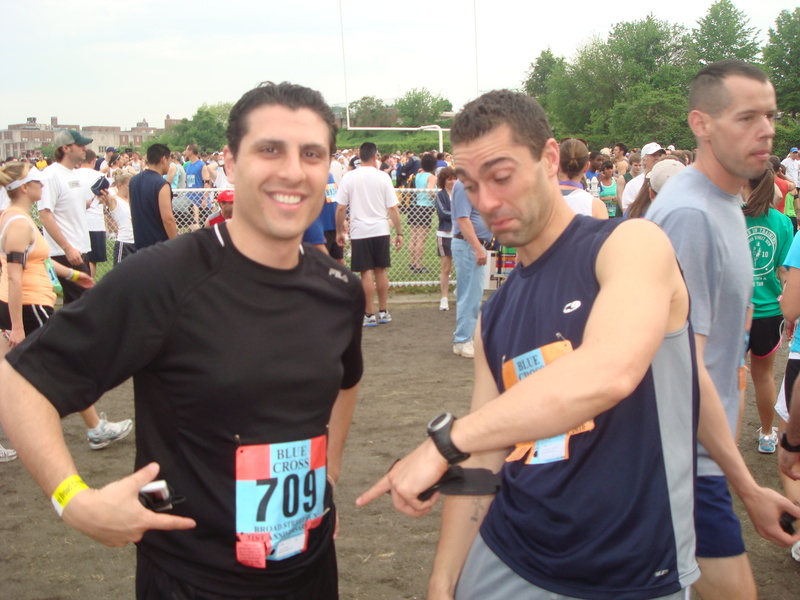 I have been having IT band issues for months and in fact I had not run since the DC Cherry Blossom run due to my injury. At mile 6 I was in so much pain in my right knee that I was biting my lip to stop from crying. At one point Jake asked me how it was going and I remember I started to tear up and said I was sad that I would not reach my goal of a 9:30 min/mile pace. Fact #4: It is extremely frustrating to finally have lungs that can handle running fast, only to have pain in one leg. I am accustomed to being held back from running fast from being out of breath, but this was the first time that something else held me back. At one point Jake asked if he could go ahead to bust out the last 2.5 miles since I was there to run with Gina. It seemed like a great idea until the pain in my knee went from ok to intolerable. I felt really bad not be there for Gina, but I had to stop for a minute to stretch out my leg and I did not want to hold her back. At least we got to see the Mummers together! I stopped for a solid 30-45 seconds and just stretched and gave myself a pep talk. I could have just quit, and honestly, that would have been the smarter decision for my body, but I had to finish for myself. At that point all I cared about was finishing without doing more damage to my IT band/knee. I tried to catch up to Gina and busted out a 7 min/mile pace for about 4-5 minutes, but the pain became unbearable when running that fast. I walked for a few and stopped to stretch again, negating any distance I covered by running fast. I then kept looking at my Garmin and focused on going no faster than a 10 minute mile pace… and just finishing. I have wanted to run the Broad Street Run for 3 years, and this was my chance. Then… mile 9. Blood, sweat, and tears. Take away the blood and you have sweat and tears. When I crossed mile 9 I started sobbing uncontrollably while running. You know the sobs where you shake so hard from your tears? That type of sobbing. It was embarrassing, but I couldn’t stop it. As I get older, I cry more easily. The pain was shooting up from my knee and into my thigh and I just wanted to be done. I cursed myself for deciding to run it despite having an injury, and I just wanted to disappear from that moment! Fact #5: Runners are amazing. An older gentleman patted me on the back while passing me and told me that it was going to be ok and I am almost done. The kindness of that stranger helped me block out the pain and just finish the race. For once, crossing the finish line was completely anticlimatic for me. I burst into happy tears that I was done, but all I cared about was getting some ice for my knee. I congratulated the runners around me and headed over to our meeting point of bus #10. 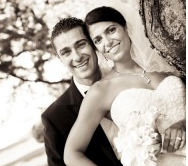 When I saw my friends Garo & Erika, I immediately burst into tears again and tried to pull my hat low. That time, the tears were not for the pain I felt physically, but the pain of not reaching my goal. I know that running is just running, and while I am happy that I finished the race, I still can’t help but be disappointed. I wish that I had not had that pain so I could have reached my goal, but I know that taking care of my body comes first. I can’t wait to heal up and take care of this issue and do the Broad Street Run again next year. 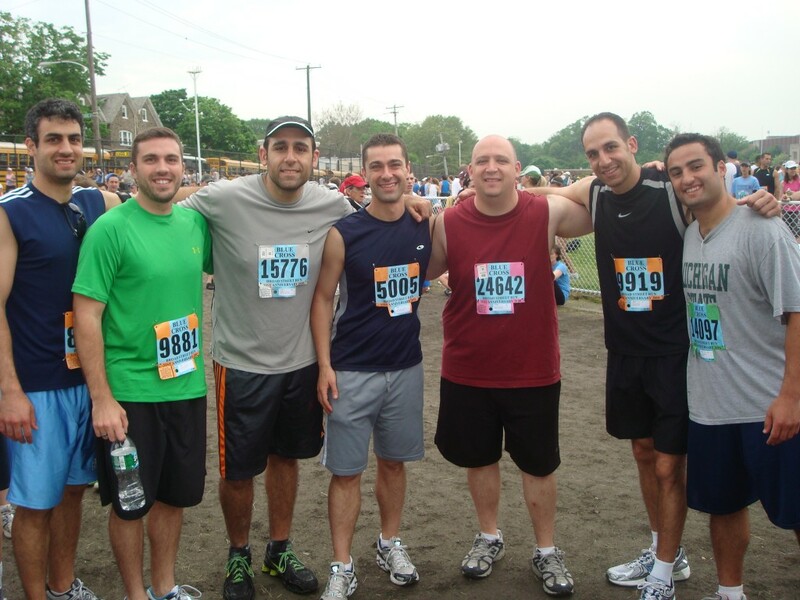 So many of our friends ran in a race for the first time yesterday, including my cousin Raz. I feel so proud and happy for all of them, and I hope that their passion for running continues so we can all run the Broad Street Run again next year. In the meantime, I plan to focus on swimming to get ready for the sprint triathlon this summer, yoga to strengthen my body and mind, stretching to solve that IT band issue, and boot camp classes for fun. 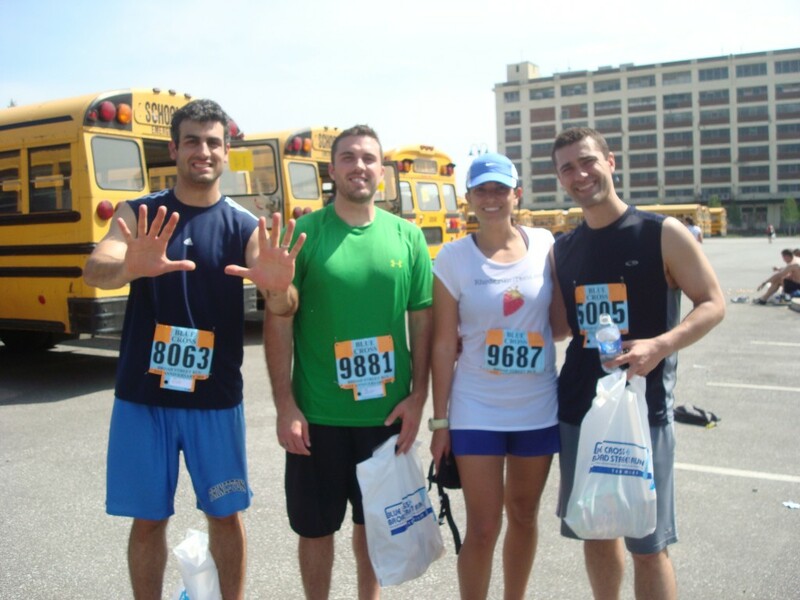 Congratulations to all of yesterday’s Broad Street Run finishers! A special congratulations goes out to one of my best friends, Dadriana, for finishing her half marathon in Rhode Island yesterday in 1:56!!!! Congratulations and happy birthday D!!!!! Also, please check out the new healthbuzz section of Foodbuzz! If you have any race stories, or if you ran in the Broad Street Run yesterday, feel free to share stories and links in the comments section! I’m so sorry to read this, hun 🙁 I hope your IT band gets better soon – there will always be more Broad Street runs 🙂 Just remember this was not your only chance! There will be many more to come, and in the meantime, many other fun activities to do besides running while you let your body heal. I am sorry to hear about your IT band issues – I struggle with those too and now a new foot issue and it so frustrating to be limited by them. 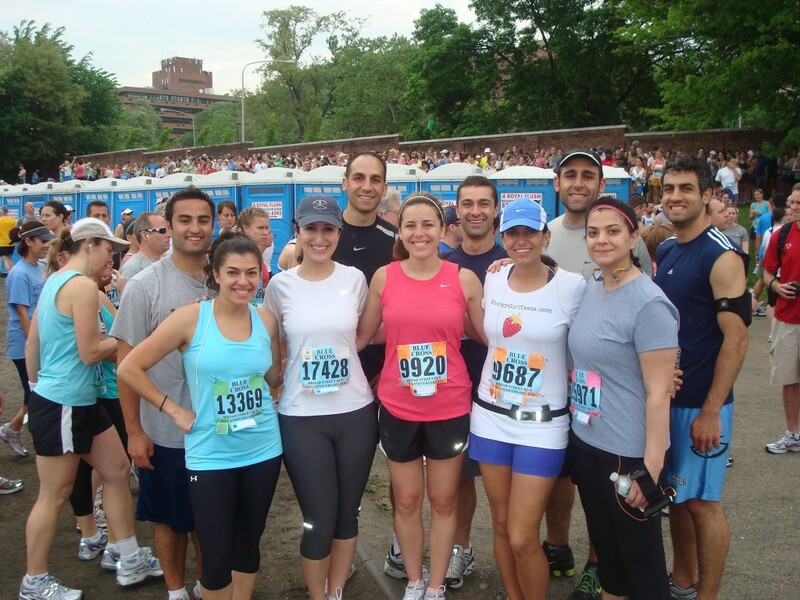 You still ran an amazing race and your summer plans sound like a lot of fun! Sorry about your IT band, but you finished! Woo! I know the feeling! I’m so competitive with myself it kills me! I ruined my IT band and my Fat pad in my knee in a 5k about 5 years ago and have yet to run a race today. Not because I can’t but bc of my fear of overtraining and not being able to run AT ALL. Take it easy, be safe, rest it! I was out for over a year!! Still get overzealous sometimes but I’m glad you stuck with it, brava! this EXACT thing happened to me during my half marathon. there is nothing in the world more frustrating knowing you’re athletically capable of something but your body just fails you. Oh man! That is so awesome that you finished despite the pain! Great job Sabrina! yes, focus on the other activities for a bit and get the IT band back to good! <3 you girl- adorable pictures. 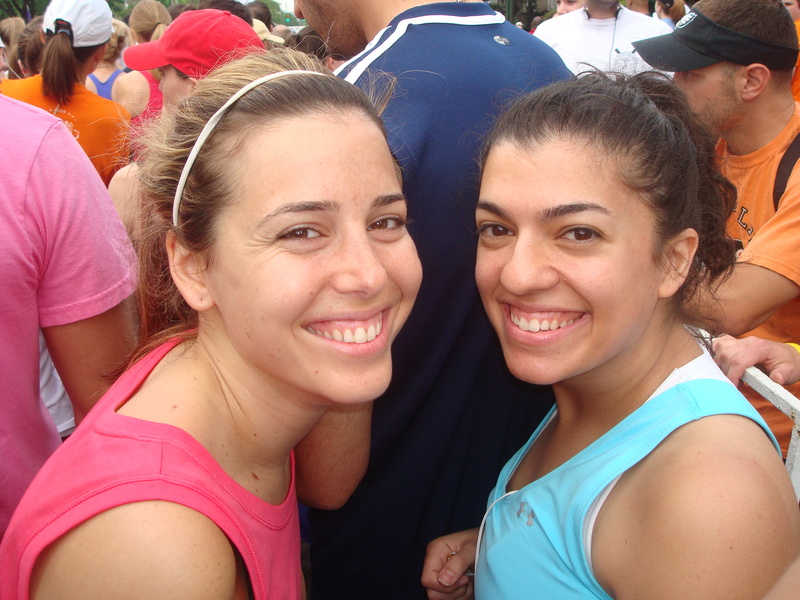 Again- love so much that you and your friends run together. For such an injury, I’m so impressed you were able to push through and finish like you did. That shows so much! Congratulations! And one day your legs will be back in action and this race will be a precursor for so many bigger and better ones. Congrats on pushing through the pain to finish — and that time is NO JOKE, especially in the disgusting conditions! Wow! I can’t believe that you were able to finish with an injury like that! You should be extremely proud of your determination. I ran Broad Street Run yesterday too, and agree with you completely on the starting time. From about mile 3 and on I was uncomfortably hot, and by mile 7 my legs felt like lead! Although I really appreciated the hydrant sprinklers and water stations, the heat really slowed me down! Congrats Sabrina! I’m so impressed with you that you finished. Many of my friends ran the race and said the same thing about the starting time and the heat – I can’t believe how hot it was! And as for your injury – I’m so sorry, I can’t imagine how frustrating and painful that must be. You really should be SO proud of yourself. It sounds like you have some great plans with swimming, yoga and boot camp – I have no doubt you’ll recover stronger than ever. Awww…I’m sorry you had such troubles. Major congrats for pushing through and finishing. I hope your IT band gets better soon. Foam roll the life out of it! I flew down to Philly from Rhode Island to run the Broad Street yesterday and even though I knew the field was 30K runners, I was kind of hoping to see you there since I’m a fan of your blog! Great job on finishing with your injury–really you should be very proud of yourself. This was my first race longer than a 5K and it was amazing! The atmosphere was fantastic–the runners, the spectators, the volunteers–it was really an experience of a lifetime for me. It was my goal that before my baby girl turned 1 I’d run a half marathon and the Broad St. fell right when I needed a 10. I was doing it alone (hubby and baby stayed in Rhodey) and I was really nervous that i’d feel alone…but instead SO inspired by the countless runners there–young, old, fast, slow…I was inspired by people like you who pushed through your injuries and pain to finish what you set out to start. It really shows dedication and determination to run when your body is telling you not to–you should be so very proud of yourself; know that you were inspiring others all around you! Good luck on a speedy recovery! @danielle, Congratulations on reaching your first goal!! When is the half marathon? The sea of people really is motivating, isn’t it? There is nothing else like it! Good luck at the half!! 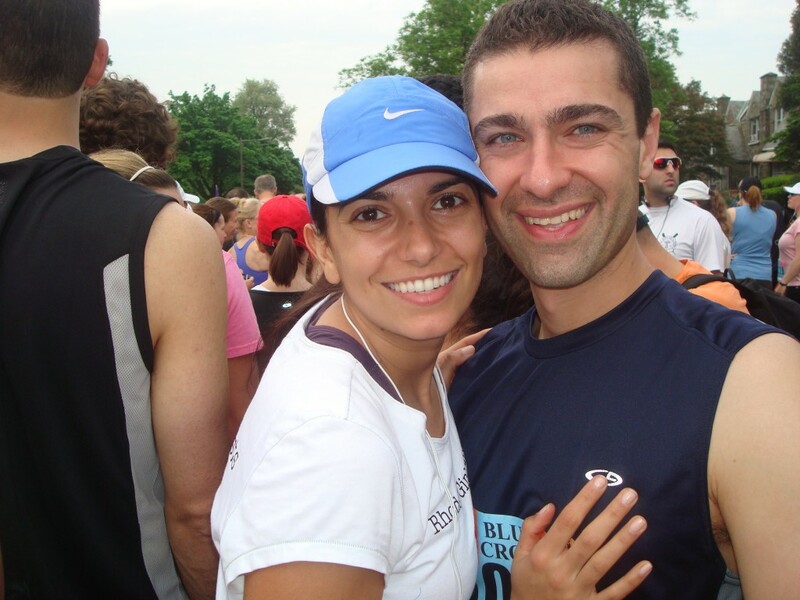 @RhodeyGirlTests, My 1/2 is in 2 weeks…May 16th Heartbreak Hill Half Marathon in Newton, MA. thanks for the luck! Looks like you had a great time with friends. Awww – I´m so sorry to hear you felt so much pain, Sabrina! Those were such lovely pics! Wish you a wonderful week, love! I hope your IT band heals quickly. injuries are so frustrating, sometimes the emotional pain is worse than the physical. I’m so sorry about your knee, believe me, I know exactly what kind of pain you are talking about and it is brutal!! The only advice I can give, is rest, stretch, and some hip flexor strength exercises. Honestly I’m about to go back in for a follow up visit with my doctor, because PT doesn’t seem to be working as it should. Good luck Sabrina! Broad Street is a good one, I was bummed to not run this year but IT issues kept me out as well. I Have been there with the tears in eyes and a few miles to go – the pain is overwhelming, I know. If you don’t have one, I’d really encourage you to invest in a foam roller and/or The Stick (they’re always selling that one at the expos). This has really been a real help for me, using the foam roller every day (oww it hurts!) and then the Stick post-runs. As well, pigeon pose in Yoga is fantastic for stretching, and obviously there’s a whole slew of other stretches designed to help. Another big things is massages – even if you can get someone to just do deep tissue for 30 mins on your hips, thighs, calfs…it really help to break it up. I can’t imagine having run this year in that heat – the past two years we had rain which can be annoying but so much better than what everyone went through this year. Hi Sabrina! I also ran the Broad Street Run and your recap really resounded with me, because I too had terrible knee pain. It was extremely frustrating to feel like I could do much more if my knee didn’t hurt. Still, I beat last year’s time by 2 minutes, even in the heat – I am proud. Thanks for sharing your story and happy running! @Maureen, Congratulations on beating last year’s time!!!! Happy running to you too- I hope your pain goes away asap! Wow, that sounded brutal. I hope your leg starts feeling better! 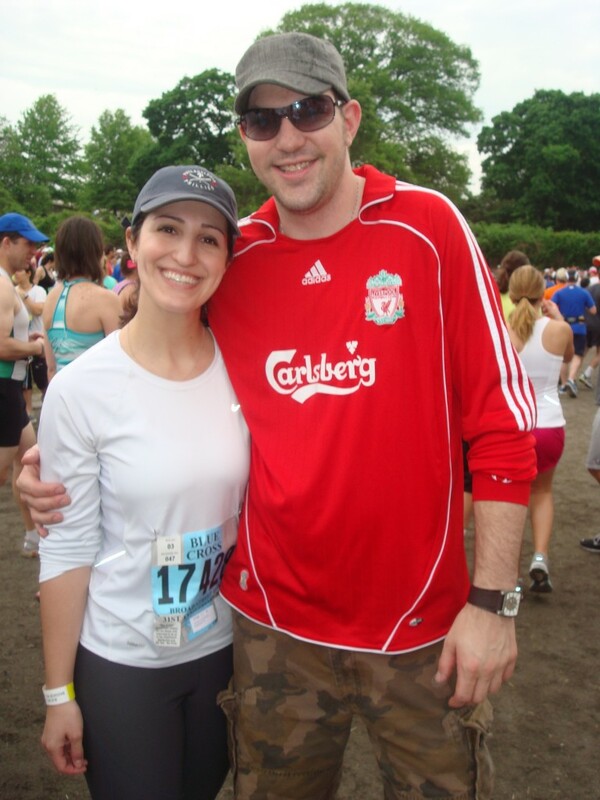 Sabrina, Congratulations on finishing the race despite the pain. I hope you’re feeling better soon- yoga, swim and cross training in general sound like they’ll be a great change of pace. I ran my first half marathon in Providence on Sunday. Training for an event and doing it is a great accomplishment. Thanks for all of your inspiration!! @Michelle @ Life, With Relish, Congratulations on your race!!!! I found your blog on the Daily Local News site and loved reading your story- it’s inspiring and your candor is refreshing! I’m training for the Philly Half Marathon this November as a goal to celebrate near recovery after a long illness. I’m a fellow blogger and find it empowering to connect with others whose stories like yours motivate us to keep going! You go girl for working through that IT band issue. Best of luck in your future adventures and keep running!